With the start of the season fast approaching, I thought it was worth a shot. Getting hold of the Chief Executive of the SPFL was easier than expected. I found his business card in a local phone box. "Neil," I said, "I see you're still looking for a sponsor for the league. Tell you what, I'll give you a can of Tizer if you call it the Narey's Toepoker League." Neil Doncaster pondered this for a moment. "It's a tempting offer, no doubt, but I think it underestimates the value of our brand. If you could throw in a pack of wine gums as well though..."
"Sorry, mate, no dice. It's the Tizer or nothing." Okay, so the above anecdote may not be completely true. What is true, however, is that for the second season running the Scottish Professional Football League is without a title sponsor. For a professional football league, that's pretty incredible. Given that Clydesdale Bank previously sponsored the SPL to the tune of £8million per season, that's a rather big financial hole there. SFL clubs had a much smaller deal with Irn Bru - about £1million per season - but now they are getting diddly squat as well. So that's a £9million shortfall to the 42 clubs compared to two years ago. 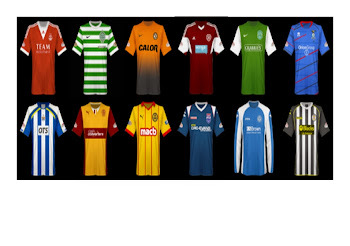 Amalgamating the SPL and the SFL just over a year ago was supposed to improve commercial opportunities, wasn't it? So either no company/organization is offering enough cash, or no company/organization wants to be so closely associated with our league. Hmm. If Doncaster and co give away the sponsorship rights cheaply, then I suppose the risk is that it devalues them for the future. But surely the longer we go without a title sponsor, the more the value will drop? The clubs are certainly feeling the pinch - Motherwell said as much when they issued their most recent set of accounts. If we are going to proceed without a sponsor, then surely some positive move could be made. BBC journalist Jim Spence had a wonderful idea a few weeks ago about offering the naming rights free to a charity - the suggestion being that, if the league couldn't get any money, it might as well do something generous. Choosing to highlight a worthy cause instead of taking some cash would surely have been good publicity as well. Sadly, there's no sign of anything like that happening. Then again, perhaps no charity wants associated with our league either? Not only is there no title sponsor, but there was also remarkably little fanfare over the start of the new season. Duncan Mackay on The Terrace has provided a long list of things which the SPFL should have done to promote the brand. These are things which would have required remarkably little cost, effort or imagination. But these proved beyond the men in charge. And yet...Doncaster and the rest of the board were re-elected last month, aside from changes to the representatives from the lower divisions, It seems inexplicable from our angle, yet the clubs seem to be satisfied with the job that the head honchos of Scottish football are doing. Do they really believe that it can't be run better than this? And if not, why aren't they raising a stink about it?